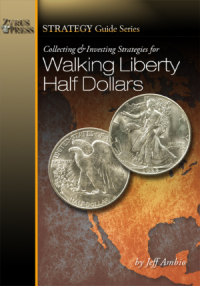 (Irvine, CA) - The second book of the “Strategy Guide Series,” Collecting and Investing Strategies for Walking Liberty Half Dollars is the perfect tool for the collector or investor of Walking Liberty Half Dollars. As the only book available on the subject today, Ambio completely reevaluates the Walking Liberty Half Dollar series in light of profound changes in the market during the past 20 years. Following a classic date-by-date analysis of each Business Strike from 1916-1947 and Proof Issues from 1936-1942, this book provides vital information on strike, luster, rarity analysis, pricing data, prices realized and significant examples. Each section concludes with Ambio’s trademark “Collecting and Investing Strategies,” which provides invaluable tips and insights into how and what to buy. If you order the book before June 1st you’ll receive free shipping. Order online at www.zyruspress.com, Amazon.com or call at 888-622-7823 to reserve your copy today.